A unique way of cooking paella, using squid instead of chicken, beef or pork. To make this paella more appetizing, you can add other seafoods as well like shrimps, mussels or crabs. Although this is a Spanish cuisine, most of our dishes has a Spanish influence so we come to love a dish like squid ink paella. By the way, Halloween is fast approaching and this dish is a perfect food to serve if you are having a Halloween party. 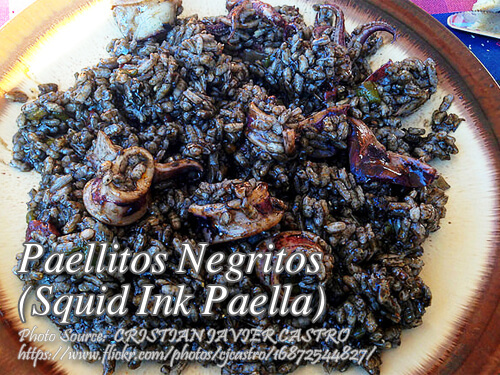 To cook paellitos negritos; Skin and clean squid and remove ink sacs. Set aside ink sacs. In hot oil, saute rice with garlic, wine, salt and pepper. Add squid (either cut into rings or kept whole). Remove squid when done and add fish or vegetable stock. Stir and add ink sacs. Ink sacs will burst to let out the ink. Stir to blend ink with rice. Add Lea & Perrins Worcestershire Sauce. Line individual ovenproof cups with Reynolds Wrap Aluminum Foil with an overlap of 2 inches and spoon the squid and rice mixture into the cups. Bake for 10 minutes in a 350°F oven. To see the complete recipe with list of ingredients in exact measurements, continue reading. Skin and clean squid and remove ink sacs. Set aside ink sacs. In hot oil, saute rice with garlic, wine, salt and pepper. Add squid (either cut into rings or kept whole). Remove squid when done and add fish or vegetable stock. Stir and add ink sacs. Ink sacs will burst to let out the ink. Stir to blend ink with rice. Add Lea & Perrins Worcestershire Sauce. Line individual ovenproof cups with Reynolds Wrap Aluminum Foil with an overlap of 2 inches and spoon the squid and rice mixture into the cups. Bake for 10 minutes in a 350°F oven. Serves 4.